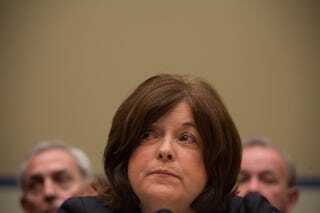 This is a photo of Julia Pierson, who, until this afternoon, was the head of the Secret Service. She resigned today after serious security lapses at the White House and at other events where the President was present. I think it's fascinating how the photographer, or the editor, chose to display this photo. I don't know if the photographer, Stephen Crowley, framed this in this way originally, or if a decision was made to crop it before publishing. But the depiction of a person who is in far over their head, in a scandal largely of their own making, is powerful and instantly clear. It is an interesting crossover between purely reporting what you are seeing versus depicting a broader sense of how it felt to be Julia Pierson in that room, facing the tough questions and coming up utterly lacking. The Times could have run a basic photo of Pierson, a portrait. But this image conveys so much more meaning.